UFC 227: What happened when Henry Cejudo challenged Demetrius Johnson for the Flyweight Title? 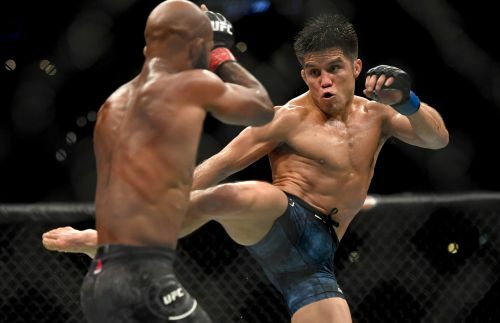 Henry Cejudo challenged long-reigning Flyweight champion, Demetrius Johnson at UFC 227, which took place on August 4, 2018. Cejudo captured the belt via Split Decision, a decade after he won a gold medal at the 2008 Beijing Olympics. He used his wrestling skill to repeatedly take down Johnson to the mat. Both men were also effective on their feet and it was a decision that in truth could have gone either way. Many observers were looking past Cejudo as the pre-fight talk centred on potential super fights for Johnson at Bantamweight. However, Cejudo silenced that talk with an impressive upset display. It was Johnson's first defeat in seven years and for Cejudo and it marked a career-defining moment. The headline fight saw new Bantamweight Champion, TJ Dillashaw defeat the man he beat for the belt, Cody Garbrandt. Dillashaw was in even more devastating form, taking less than a round to dismantle the former unbeatable challenger. Dillashaw crushed Garbrandt with a big knee and punches to retain the title. Renato Moicano made light work of Cub Swanson submitting the veteran in less than one round. He floored Swanson with a beautiful jab before locking in the rear naked choke. It was a beautiful performance by the Brazilian, earning him "Performance of the Night" honours. In the only female bout on the main card Strawweight contender, JJ Aldich bested Polyana Viana by Unanimous Decision. It was not easy on the eye but Aldrich was effective in her performance and another win could put her in line for a title shot. Rising Middleweight contender Thiago Santos won Unanimous Decision victory over newcomer Kevin Holland. Santos, who had had his four-fight winning streak snapped in April, dominated the bout from start to finish for a deserved win. Despite the two marquee main events, UFC 227 underwhelmed at the box office, pulling just 300,000 pay per view buys.